Ulster Head Coach Les Kiss. 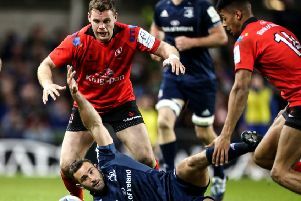 Ulster suffered their seventh defeat in 11 matches after a 16-13 Guinness PRO12 reverse to Scarlets in Parc Y Scarlets last night. A Jacob Stockdale try and two penalties and a conversion sent Ulster into the break deservedly leading 13-6 - Dan Jones kicking two penalties for the Welsh side. Andrew Trimble of Ulster is tackled by Tom Price of Scarlets. But a controversial penalty try helped Scarlets to take a narrow win. World Rugby’s new high-tackle directives, which came into play on January 3, had a crucial impact on the match when Scarlets were awarded a penalty try in the second half which also saw Ulster’s Sean Reidy sent to the sin bin by referee Marius Mitrea for a high tackle on replacement scrum-half Aled Davies after 61 minutes. “That is the new world we are living in. We are going to have to find a new way to live with it and adapt to it. The win for Scarlets kept them in fourth place, but they are now seven points ahead of Ulster, who remain sixth, three points behind Glasgow Warriors and six ahead of Cardiff Blues with those two sides meeting later on Saturday. Kiss was disappointed to see Ulster lose. “I thought we probably would have better return from it if things had gone our way. “We controlled that first half , I thought we were superb with retention of ball, but we were not as clincal as we needed to be at the start of the second half and gave them a bit of life and traction into the game. “The decisions we could not control, that is what it is. We could have controlled some of our own decisions better, but I cannot hide the disappointment of the loss that is for sure and something we just got to cop. In spite of the loss, Kiss maintains the season is far from over. “We are not in the ideal position, but we are still contenders. The players certainly believe it in the sheds and we have to make sure we dust off and get up for two big European games against two big teams and then get back on the horse for the PRO12 . “It will be an improtant Six Nations period for us, we will have injured players hopefully coming back by then which will be a big plus for us and just give our squad a bit of depth.